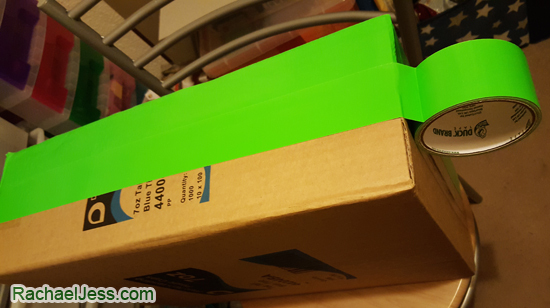 This year my son is heavily into teenage mutant ninja turtles and so that set the theme for this year's party. As this is a 4th birthday party I thought it would be nice to add a few games to the mix, rather than just a bouncy castle and some tike cars. 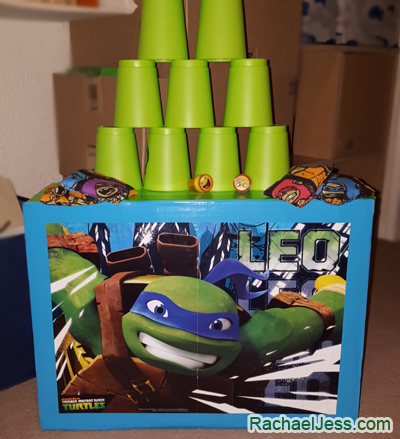 So the first of the games I made was rather easy to assemble stacking cups game. I purchased the reward stamps and stacking cups from Amazon. The stacking cups were on special off with 50% off and the stamps were purchased at a discounted price for review. 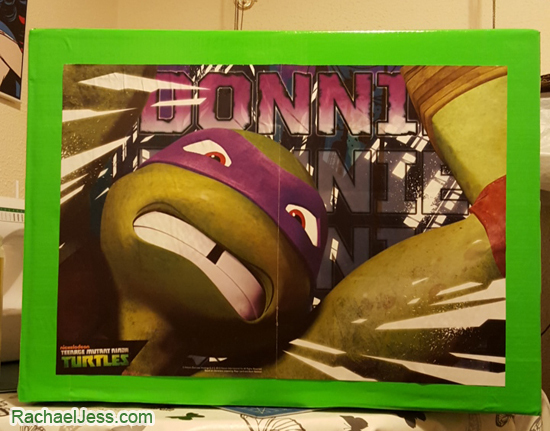 The box was just an old box from work which I covered with Duck tape (though it might make the box last a bit longer seeing as 4-year-olds were going to give it a battering) and then I found the centrefolds in the latest TMNT magazines fit very nicely in the middle. The milk cartons were filled with water and used as weights inside the box, but this doesn't need to be water, if you have a sandpit you could use the sand as a weight, pebbles etc, just something to make the box a bit more weighty as even up against a wall it has the potential to move around or over. I'm very pleased to report that the bottles did the job perfectly. 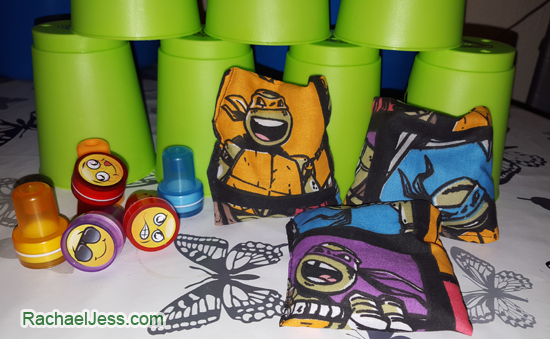 To knock the cups down I made some bean bags from TMNT material and black beans, but if you don't have bean bags, tennis balls or softballs work just as well. 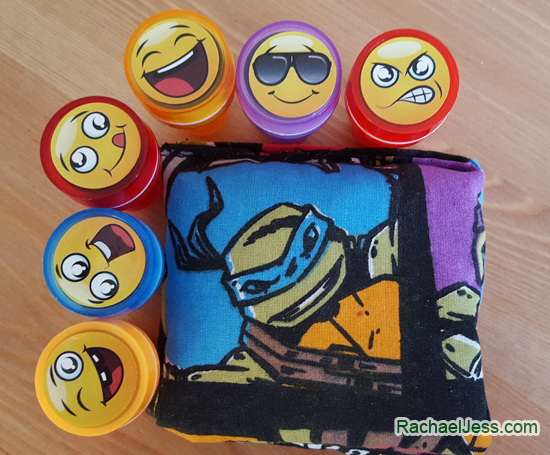 In fact, Wilkinson's have TMNT softballs for £1.50 at the moment. (Marked up as soccer balls, but they are not that big at all, normal small softballs, ideal for small hands). Once at the party I set up the cups and used tape on the floor as a marker for where the little ones needed to stand (very relaxed rule, they pretty much stood where they liked!). 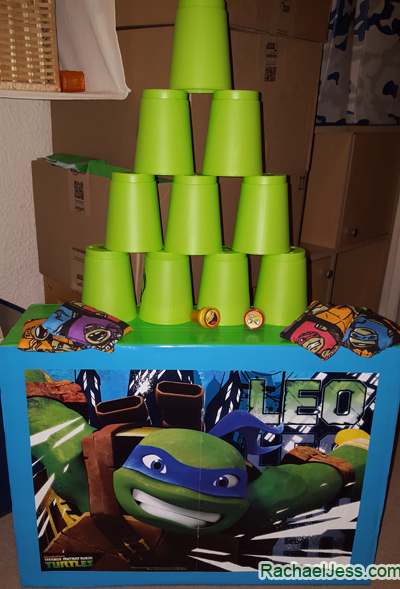 As the other games carried rewards such as sweets and party bag filler toys I decided to use the Reward Stamps from Kajman as the prize for knocking down the cups. 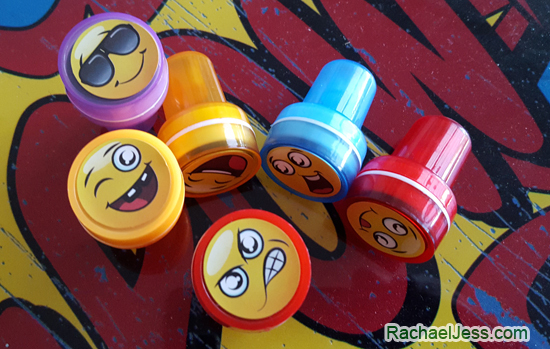 The reward stamps went down very well with the kids, as there are 6 different colours and emojis to choose from I found them coming back time and again to try and get each of the colours on their hands. These stamps are self-inking so I didn't have to worry about them drying out and had the added bonus that these came off with a baby wipe rather easily. The stamps went down well with a couple of parents asking me where I had purchased them from as they too would like them for craft days with their little ones! I'm very pleased to report that is was an extremely popular party game on Sunday. It may have been due to the noise the cups made as they hit the floor, the excitement of the destruction of the cups or the possibility of collecting all 6 stamps. My bet is a combination of all 3. This is a lovely quick and easy game to make and will keep the children amused for quite some time especially if you get them involved in the making of it.